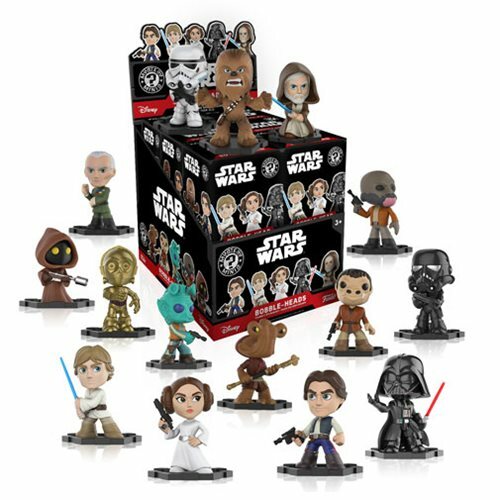 From a galaxy far, far away come Mystery Minis Bobble Head mini-figures based on the classic Star Wars characters. From Han Solo, Luke Skywalker, and Princess Leia, to Darth Vader, Jawas, and Tarkin, all your favorites are here! Each stylized vinyl figure measures 2 1/2-inches tall and comes packaged in blind boxes. Collect them all! Ages 3 and up. The Star Wars Classic Mystery Minis Bobble Head Random 4-Pack includes 4 individually packaged mini-figures.